Come and experience Brighton in the newest and most luxurious hostel in town, perfectly located between the seaside. Brighton wins a few brownie points for its exciting accommodation choices for both the well heeled and the budget conscious. No matter whether you are looking for sea view accommodation options or mid priced and budget options, you’ll find it all and more here. 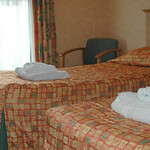 You cannot go wrong with the hen friendly hotels along the North Laine area and the seafront. From basic accommodation options to self catering apartments and cheap as chips hostels and inns, your hands will be literally full in this sea side town. Being put up right at the city centre has its own advantages. Though most of the hotels could get booked up early, if you manage to get in , you are right at the centre of all the day and night time fun that this city has to offer. Central Brighton Travelodge located near the main station is a good option for groups as you can just walk into town in a couple of minutes! The room only accommodation is a good excuse for you to explore the eclectic dining scene of Brighton as well. If beach fun is in your agenda, then Langfords Hotel will be a better option as it is only a few blocks from the beach. Most places offer attractive deals and combo offers like VIP club passes and transfer deals for early birds. Brighton could be crowded and busy all round the year and most hotels do not entertain the noisy and unruly hen groups. So, if you are a large group with a budget, opt for hostels or B & B. If all you need is clean and basic accommodation with no frills, these would work fine. Self catering apartments are for the fun loving group of hens who like to have a space of their own for all their banter and pranks on their last night of freedom. Set on their own grounds, apartments are spacious and homely. An apartment along the sea coast will be a wonderful option for the great views of the bay and the pier. Be in a world of your own in these homes away from home! Brighton has many types of accommodation options and dining facilities that would offer a comfortable stay and food. In case you are not sure how to go about it, call us for the best deals and packages.